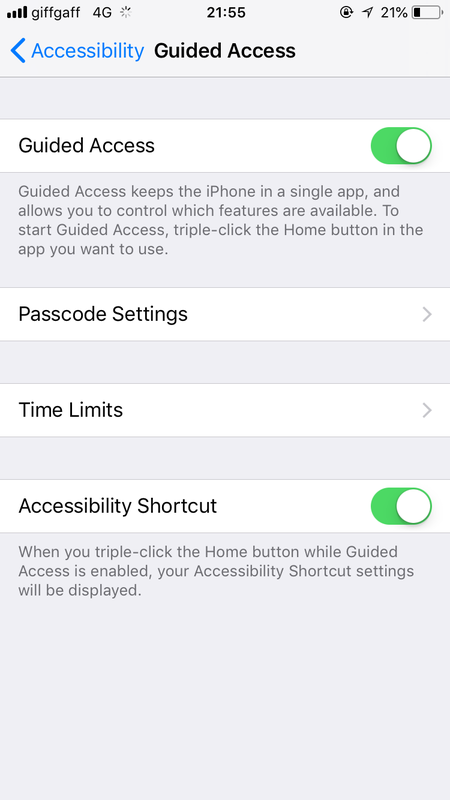 So Guided Access Mode is enabled in Settings > General > Accessibility > Guided Access. You then tripple-click the home button within any app to start it. If you enable use of the sleep/wake buttons, then when you are in Guided Access mode, putting the device to sleep and waking it does not require a passcode to be input again. I can imagine this being a useful trick for law enforcement (or thieves) to carry a device around without worrying about it locking. I suppose the rationale is that this prevents kids from racking up years of wait time on the lockscreen as they try and guess your password. But personally I see it as an issue. Guided Access mode could just use the device passcode. If you quickly alternate the device between sleep and wake, you will occasionally glitch to the homescreen. Nothing can be interacted with… you can just see some of the installed apps, and after a few seconds you end up jumping back to the guided app. This behaviour made me think that Guided Access has some sort of timed interval it checks that you are still in the correct app… and if you are not, will throw you back into it. So even if we found a bypass, we would likely need to bypass that too (spoiler alert: we do… sort of). My strategy was basically to do everything possible to an iOS device while in GAM and, at the same time, fuzz the crap out of every possible input and output… a solid plan. I smell a bug 👃🏻🐛!!! A trip to the apple store later, it turns out that statement isn’t quite right. For Photos to open, the USB3 camera adapter can’t just be plugged in by itself, and needs to be connected to a DCF-conforming device. This could be an SD card, USB drive, digital camera, or even another iOS device! If this device isn’t self-powered, it’s unlikely that an iPhone/iPad can power it, so you have to plug it into a powered USB hub, then plug the hub into the USB3 camera adapter, and then that into the iPad/iPhone. Very elegant. What’s great is that, if Photos is already open, re-inserting the adapter wont send you back to the main viewcontroller. So any actions you managed to snipe into the Photos app, or text you managed to type… will persist. So it is possible to, incredibly slowly and unreliably, use the Photos app! The Photos app has the power to show/edit contacts, view/send iMessages, post tweets and facebook posts, and do all manner of things with third party apps like Whatsapp. So, although technically not a complete break-out of GAM, it’s a good level of device compromise… and possibly enough to deliver jailbreak code to a device, which is the ultimate win really. To keep the device in the Photos app for longer, and make the race condition far more usable, we can do something incredibly hacky… slow the device down! If the app you get stuck in has some form of unrestricted text input, or the ability to add anything new that consumes RAM or CPU cycles, then you just need to keep adding things to the app until the device becomes incredibly unresponsive. At this point, you’ll find that it takes far longer for the device to transition to the Photos app when the adapter is plugged in, but that when it does, the Photos app is usable for minutes, rather than the usual split-second. The difference is very substantial. A pretty simple fix here, the logic to open the Photos app (when appropriate accessories are inserted) should first check if GAM is on. Weirdly, this logic is in place for Single-App mode, which is actually built on Guided Access mode. Bizarre. The young chap assigned to this case, who gave that response, is rather misguided in my opinion, but I don’t have time to argue the toss via email. At least we can say to our clients that, categorically, GAM is not a substitute for SAM – that’s a win in my book! As pointed out by @op_nomad, iOS is actually a DCF-compatible device, so you can break out of GAM mode using a second iDevice. Post updated. The other Camera adapters from Apple, and third-parties, also work.